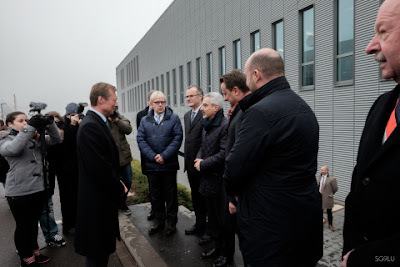 Yesterday (November 27th), Grand Duke Henri was in Betzdorf for the inauguration of the new ATF (or Antenna Field Technical Facility) building for SES S.A. The Betzdorf Satellite Operations Centre (SOC) now offers ongoing monitoring across 33 satellites, but is positioned to host as many as 100 satellites that cover services ranging from television programming to airline WIFI to government requirements. Prime Minister Xavier Bettel and Deputy Prime Minister Etienne Schneider were also present for the inauguration. A little more info about the satellites and the facility in general here and (in English) here.